This will be the last archery target you will ever have to buy. 365 Archery's patent-pending design incorporates a novel center core cube that allows the archer to utilize all six sides of the center core before replacing it! 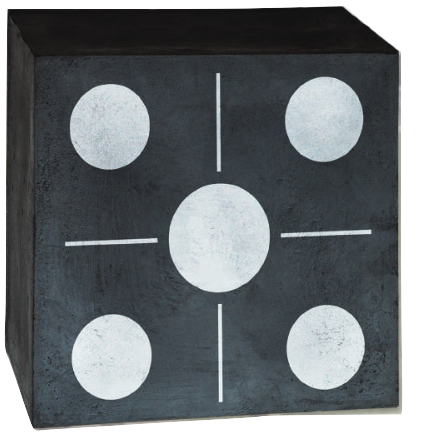 Unlike other targets that typically can only be shot on two sides, our target can be shot on all six sides! The 365 Archery proprietary "Self Sealing" Foam provides for superior stopping power even for crossbow bolts. 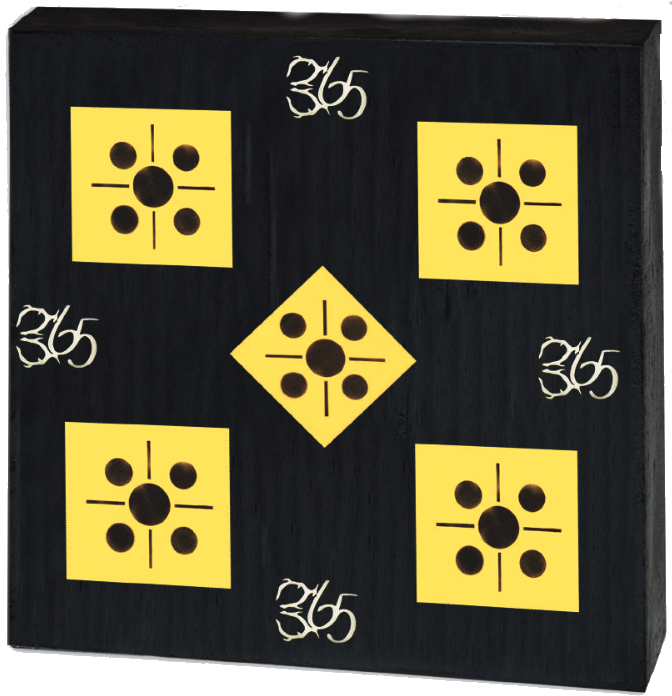 365 Archery's High Performance 5-Core Target has 5 removable cores, that can be rotated to utilize all 6 shooting surfaces. 365 Archery's proprietary "self healing" foam provides superior arrow stopping power for all bows and crossbows, with easy arrow removal. This 48 inch target is the perfect answer for multiple archers, as it allows each person to have a separate target. The HP 5-core target comes with a support base, providing additional support and allows the target to be shot without anchoring it to the ground. When all 6 sides of a core are shot out, you can simply purchase a new center core at the fraction of the cost of most typical targets on the market! 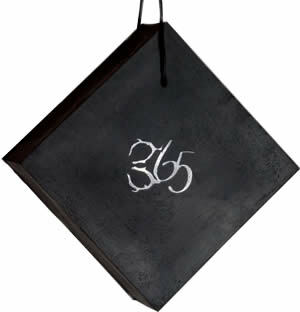 365 Archeck target offers a log of stopping power in a small package. You can either set it on the ground or tie it to a branch or fence with sportsman wire attached to it to shoot it. 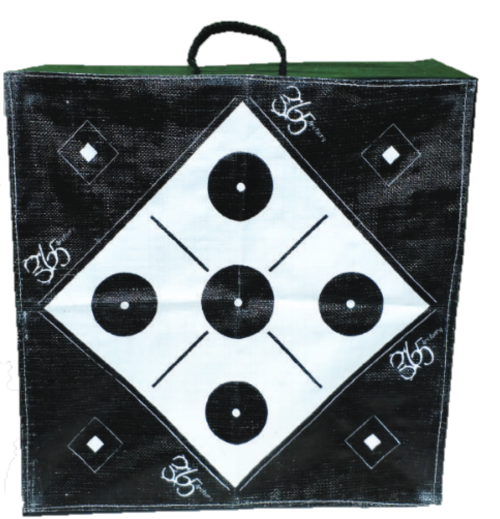 365 Archery Bag Targets are constructed with advanced materials for maximum target life without passthroughs. High contrast graphics are easy to see especially at long ranges. Built-in heavy duty handle for easy convenient transport. Available in 24" x 24", 24" x 48" and 48" x 48". 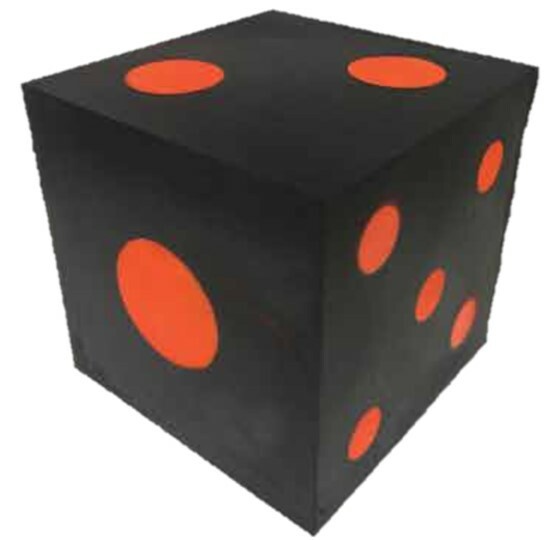 The Safari Dot Cube Target was designed for the popular 3D shoots that utilizes the orange dot as a scoring bullseye. Each size orange dot is meant to be shot at a certain distance: 20cm (100 yeards), 13cm (61-88 yards), 10cm (31-60 yards), 7cm (20-30 yards), and 4cm (4-19 yards). This Safari cube is a must for anyone who is practicing for these style shoots. The 52" Square 5-Core XL Target was designed for Archery Clubs and Ranges who are looking for an all foam target that will last several tournaments and yet offer easy arrow removal. 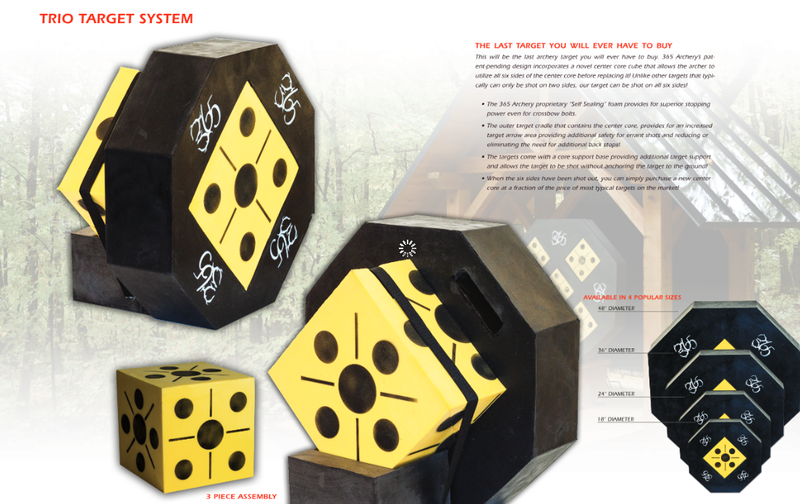 Each of the 4-14" and 1-10" yellow cores are replaceable and can be rotated to the 6 shooting surfaces. 365 Archery "self healing" proprietary foam will withstand the abuse of several tournaments before the cores need to be replaced at a fraction of the cost of a new target. 365 Archery Crossbow Target is a field tip only target that will stop all the high speed crossbows on the market and yet offer very easy arrow removal.